Former CBS News Colleague Calls O'Reilly's Combat Claim "Absurd"
Another one of Bill O'Reilly's former colleagues at CBS News is casting doubt on his claims that he reported from a "combat situation" in Buenos Aires during the Falklands War. Charles Krause, a CBS News correspondent from 1980 to 1983 who reported from Buenos Aires during the same period as O'Reilly, is the latest to contradict the Fox News host. In an interview with Media Matters, Krause called O'Reilly's descriptions of his reporting "absurd." He also recalls O'Reilly being there for a short period of time and not having "any significant role in our coverage of the war." "I don't recall him doing any major story that anybody remembers and he was there a very short time, then he was recalled, I don't know why," Krause said. "He wasn't a team player and people thought he was grandstanding, basically." O'Reilly's past claims about his 1982 reporting from the region have come under scrutiny following a Mother Jones investigation that found while O'Reilly has suggested that he actually reported from the Falklands during the war, no CBS reporter had done so. O'Reilly responded with claims he had never said he was in the Falklands, but stood by his assertions that he had been in Buenos Aires and covered what he termed a "war zone" and "combat situation." CNN's Brian Stelter on Sunday reported that seven of O'Reilly's former colleagues who reported from Buenos Aires refuted his claims. 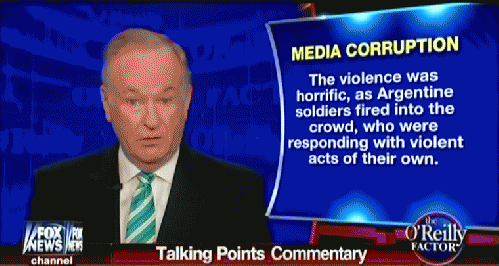 Media Matters has identified several additional instances in which O'Reilly suggested his reporting had been from a combat zone. Krause, a former Washington Post reporter who had lived in Buenos Aires for three years prior to the war, said O'Reilly's claims are wrong. "That's absurd because Buenos Aires was Buenos Aires," Krause said about the war zone claim in an interview Sunday. "It was just like it always was, there was very little evidence of the war in Buenos Aires. The war was being fought thousands of miles away." Krause joined several of the journalists quoted by Stelter in casting doubt on O'Reilly's claim that he had witnessed a violent protest in which several demonstrators had been killed. "There's a difference between demonstrations and rioting," Krause said. "I don't recall there being rioting, there could have been scuffling." Krause said he was one of the first reporters there covering the conflict and stayed through the end of hostilities. "The only danger that we were in was we were staying at the Sheraton Hotel, which was this massive, modern tower overlooking the city. We were in no danger whatsoever," he said. "Except for people who had never been there before and didn't speak Spanish and might have felt a little bit odd. I had lived in Buenos Aires, there wasn't any particular danger. After the U.S. supported Britain there were some anti-American demonstrations a little bit and if you went out it was better not to advertise the fact you were American." Krause also said he does not recall any CBS cameraman being injured and bleeding, as O'Reilly contends. According to Stelter, "CNN has interviewed seven people who were there for CBS, and none of them recall anyone from the network being injured." The photographer, identified by O'Reilly as Robert Moreno, declined to comment to CNN.